First of all, if you’re one of our backers, many thanks are in order! It seems like just yesterday we were all here cheering on Giana’s pledge count, running around on fire and smashing the f5 key like there was no tomorrow. Now we are here with Ravensdale, and a lot has changed, we’re a little more organized, a little more prepared, and a lot more excited. Kickstarting Giana was an outstanding finish to a deserving IP, and Ravensdale is the birth of a new one. We would also like to give a huge thank you to In Extremo for taking a liking to our goopy, gritty, gnarly orcs and she-orcs. We are so excited to be working with them, and there are more details involving the band to come! The events on the calendar sometimes take place in different locations, (such as our live streams and chats) which are listed under the event inside the calendar so you will know exactly where to go to witness the event. The sure-fire way to not miss an event, would be to back the project at the $5 tier at least and get early access to all this material in our Ravensdale developer forum. Event materials such as videos and announcements happen in our developer forum first! Otherwise, you can follow our developer blog which is not backer-exclusive, and will keep you promptly updated with all our events. The calendar will be updated twice during the entire campaign, we will post the latest iterations as they come. Tuesday, July 16th: Team Spotlight #1. Get a look inside Black Forest Games and at behind-the-scenes footage of Ravensdale. Each week we cover one or two new departments, and follow the progress of the game from the team’s perspective. Watch the first episode here! Wednesday, July 17th: Reddit AMA. 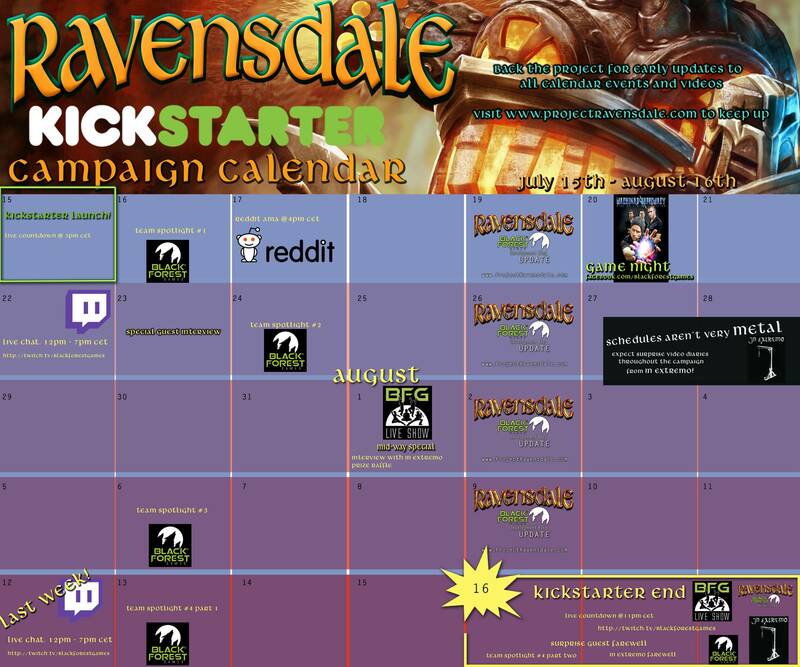 Got a question about Ravensdale, Kickstarter, or just game development in general? Join us on reddit.com/r/iama at 4pm CET (10am EDT) – at least 8pm CET to chat with the developers and get the answers to any question you might have for us in a no-holds-barred environment. It’s called Ask Us Anything for a reason, and we’d love to not only chat about Ravensdale, but also answer questions about Kickstarter from a veteran-game-developer-turned independent perspective. Saturday, July 20th: Game Night With Machinae Supremacy. For those of you who are new to our community, Machinae Supremacy crafted the heavy metal version of the Giana Sisters: Twisted Dreams soundtrack that was created alongside Chris Huelsbeck last year. They are a really fun, great group of guys that are maybe a little too prepared to frag us this Saturday at 6pm CET on Unreal Tournament 1999. We host the servers, you sign on, we all shoot at each other. For more details visit the facebook event or check out our dev blog. Monday, July 22nd: Chat Live With The Team: Join us on our twitch channel on Monday from 12 noon to 7pm CET and hang out with us all the live-long day. The Kickstarter Team will be joined by Ravensdale gameplay programmer David Paris and technical art director Eric Urocki. Both have extensive histories in the gaming industry and would be happy to answer any questions you might have about the game or the industry in general. Last but not least, as of today we’ve launched our developer forum, where you can browse through exclusive content before they hit our other community channels, including what will be announced on our next kickstarter update. To get access to the developer forum, send us an e-mail at forum@bfgames.biz and include “Development Forum Access” in the subject line (case sensitive) as well as your username and pledge level. You will not see the Ravensdale section of the forum unless you go through this process. We have a few surprises for you already, and you will hear about them all first on the Developer Forum. This includes a surprise, very important addition to our development team that will come next week. This update is running a little long now though, I should go. Regards, The Black Forest Games Team.